A customized keto lifestyle is one of the best tools for disease prevention and rapid fat burning in the 21st century. Incorporating keto meals and strategies into a healthy nutrition plan is a great way to maximize the health of your growing family, but it can feel pretty restrictive. Cutting back so severely on carbs is a big change, and many people still experience cravings for breads and other carbs while on a keto diet. But guess what? Turns out there are keto bread alternatives that are delicious, easy to make, and won’t take your body out of ketosis. So if you’re ready to dive into the world of keto bread and start crafting your own low-carb loaves, you’ve come to the right place. In this article, we’ll cover some of the basics of keto bread — what it is, how it’s generally made, and some of the quirks to keep in mind when baking. But we’ll also list out some recipes for various breads and rolls that you can try your hand in making. First, let’s dig into the nitty gritty: what is keto bread? Keto bread is just what it sounds like — it’s bread, but it’s not made from traditional wheat flour like regular bread is. Rather, keto bread is generally made from nut flours, which are high in protein and naturally low in carbs, so they won’t disrupt your body’s ketosis process. Additionally, keto breads typically contain eggs for added protein and texture. But this also means that you have to be careful in the actual bread-making process to ensure that your ingredients are properly prepared and mixed, or otherwise your bread may end up with an “eggy” taste. Just to give you an idea of the difference, one slice of just a basic keto bread made with almond flour is only one carb per serving — where the average slice of white bread, like what you’d buy at the store, is a whopping 35 carbs! So when you’re trying to stay within a certain number of carbs in a day but still want to keep breads in your life, keto bread is one of the best ways to get that texture and taste without having to stress about your carb count. Now let’s take a little time to talk about the ingredients that make keto bread so unique. Like we mentioned above, the biggest difference in low-carb bread is the flour from which it’s made. A huge upside is that all of the keto bread flours are gluten-free so this is especially helpful if you’re one of the many people avoiding gluten for improved health or because you have a condition like Celiac Disease. We’re going to take a look at the most commonly used flours in keto bread, along with their benefits and tips for baking successfully. Almond flour is made from finely ground almonds (obviously) and is naturally quite high in protein. It also has a low carb count and is high in healthy fats, making it a great base off of which to build your low-carb breads. Another benefit of this type of flour is that it’s rich in vitamin E, manganese, and magnesium, so you’re getting even more nutrients to boost your body. Now, one thing to remember with almond flour is that it makes a bread that tends to be rather dense, just due to its difference in texture and mass. So when you’re baking a low-carb bread with almond flour, you’ll most likely need a leavening agent like baking soda or yeast to help lighten up the texture. Coconut flour is another common base for keto breads, and is slightly lower in protein than almond flour but it contains lots of fiber and healthy fats to accommodate for this fact. And, it’s also packed full of iron and other minerals, which are great for battling fatigue and maintaining healthy skin and hair. This flour is also gluten-free, so it’s the ideal option for anyone battling Celiac’s disease or who has some other gluten intolerance. One consideration when baking with coconut flour is that its measurements are not always equivalent with that of flour. So you can’t necessarily just choose a bread recipe and swap out the wheat flour for coconut flour. The problem is, coconut flour is much more absorbent than wheat flour, so you don’t need nearly as much coconut flour to get the same results. In general, the ratio is ⅓ of a cup of coconut flour for every 1 cup of wheat flour. Another quirk of coconut flour is that it has a tendency to become overly dry when it’s baked, but you can easily avoid this issue by increasing your egg count or even adding in some puréed veggies or low-carb fruits. In case you’ve never heard of arrowroot powder, this is a fine powder that comes from the arrowroot plant. While a lot of recipes use this more as a thickener, it can also be used in keto bread, not as the sole flour, but mixed in with almond flour or coconut flour to create a lighter texture. As we mentioned previously, most keto breads contain eggs in order to increase moisture and lighten the texture. But many low-carb breads also contain healthy fats like butter and coconut oil, which gives a rich taste and helps you meet your fat macros for the keto diet. And now that you know the basic ingredients and a few best practices, let’s dig into some actual recipes so you can try your hand and taste them for yourself! If you need an all-around, versatile keto bread recipe for just everyday eating, this one’s for you. It’s made from almond flour, eggs, and a handful of other ingredients, but it’s a surprisingly easy recipe to put together. Just be sure to carefully follow the instructions, especially regarding your egg temperature, to ensure that your bread comes out at the right texture and taste. This is the keto bread recipe you’ll want to keep in your back pocket, and maybe even double-batch and freeze so you always have some bread on hand. Another super-basic and delicious keto bread recipe, the main difference between this and the previous recipe is that this one uses coconut flour rather than almond flour. It gives a slightly different taste and texture, so be sure to try both to see which one you like better. The great thing about this keto bread recipe is that is one of the easiest ones out there. Literally just mix your ingredients together and bake. But do remember that with coconut flour, you will need to mix it very thoroughly, as this flour has a tendency to clump. Breakfast calls for biscuits, but on a keto diet, that’s a big no-no. For those mornings where you just need your biscuits and gravy, this is the best keto bread for you. Almond flour replaces the typical white flour, so you boost your proteins and fats while still getting that flaky biscuit taste. Have you ever had keto bulletproof coffee? Well, this is the bread equivalent. This bread is entirely made up of protein and fat — simply eggs and collagen protein. While this one requires a little bit of technique to get it perfect (you have to beat the egg whites until stiff and mix them in properly), it’s well worth it, as it’s stacked with the nutrients you need to stay in ketosis and kill cravings. Need a unique side for your next keto dinner? Broccoli cheddar loaf to the rescue! This bread is based in coconut flour, but also contains cheese and chopped broccoli for a cheesy, flavorful, veggie-ful side. It’s great pan-toasted or fresh off the loaf, and goes well with breakfast, lunch, or dinner. And you can easily customize it by experimenting with other cheese blends or veggie options. Sourdough is an art — it takes time and patience, and this cashew sourdough bread is no different. You’ll have to culture the dough in your oven for several hours to get the sour taste, but trust us — it’s well worth the wait. This bread is made from ground cashews for a rich taste, and it’s dense like an artisan sourdough. It’s perfect for toasting, eating plain, or using for sandwiches or a side. Patience and practice pays off with this one, so give yourself a go and enjoy the experience! Bagels. Just the word makes me want to sink my teeth into the doughy goodness smeared with rich cream cheese! If you love bagels as much as I do, then you know how difficult they are to give up when you’re on keto. But thankfully this keto bagel recipe takes away this dilemma. 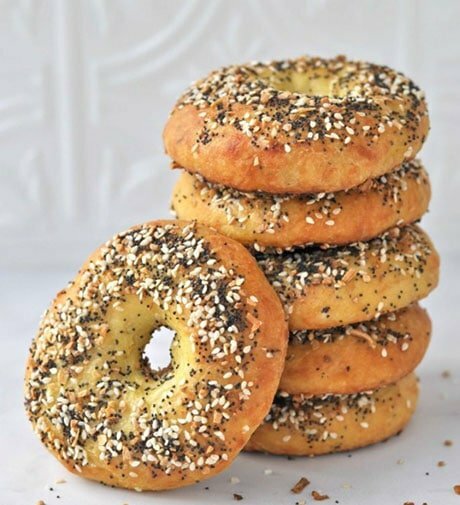 These bagels are based in almond flour, but are also packed full of mozzarella cheese to give that chewy texture that bagels are so known for. And of course, top it off with your “everything” seasoning, and you’ve got breakfast set for days! On a keto diet, most people just avoid sandwiches, or roll up their meats and cheeses in a lettuce leaf or a low-carb wrap. But occasionally lunch just calls for a little something more. These low-carb sandwich rolls are super versatile — you can slice them and top them with your favorite sandwich stuffings, or just butter them and serve them with your evening dinner. Top them with your choice of sesame seeds or herbs, or just leave them plain and enjoy as-is. Where would chili be without cornbread? While this recipe isn’t technically cornbread since it’s made with almond meal, not cornmeal, but it’s just as delicious and pairs perfectly with your keto chili. The best part is, it’s only 6 ingredients, and can be prepped and ready in 30 minutes. If you like your cornbread sweet, add a touch of stevia for a little sweetness and no carb impact. One of the hardest parts about keto for me is the huge cutback on fruits. But, there are exceptions to every rule — and blueberries and lemons do fit into a keto diet, due to their low sugar content. 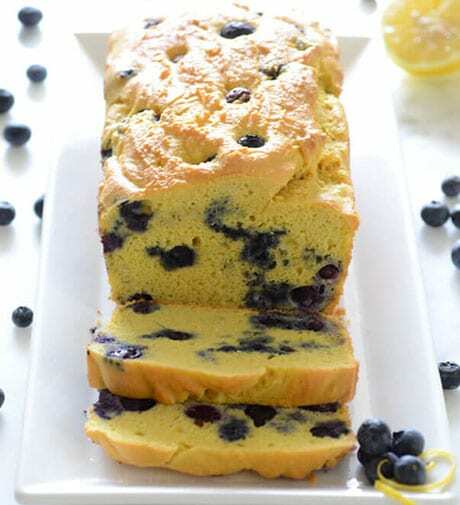 This keto bread recipe capitalizes on this fact, and incorporates both of these keto-friendly fruits into a sweet and tangy quick bread. Top it with butter or pair it with your morning coffee for a sweet and satisfying low carb treat. Store this bread in the fridge so it stays fresh! What’s a burger without the bun? Similar to the sandwich dilemma, burgers are often wrapped in lettuce when eating keto, to avoid all the carbs of a bun. However, sometimes you just want the texture of a bun for your burger — or you want to avoid the mess of wrapping a burger in lettuce! In this case, go with these keto hamburger buns. Similar to our bagel recipe from earlier, these are mainly made from almond flour and cheese, so while they may not have the same texture as your classic hamburger bun, they won’t fall apart as you’re eating, and they give the same satisfaction of bread. When you want to branch out from the typical almond or coconut flour bread, try this dense and satisfying flax bread! It’s darker in color, more like a wheat bread, but it’s made primarily with flax seed so it’s chock-full of protein and fiber. This is one recipe that calls for several ingredients that are probably items you don’t normally keep stocked in your pantry — but once you give this bread a try, you’ll definitely want to make it again! I love herbs and I love olive oil, so naturally I also love focaccia bread. It’s one of the absolute best pairings with a hearty Italian meal, or anything saucy that you can dip your bread into. And thank goodness for this low carb focaccia recipe. The rosemary and garlic combination totally makes it — and you can use it to accompany a meal, or even add toppings to make it a sandwich. Pumpkin spice makes everything nice! Whether it’s fall or not, you’ll adore this keto pumpkin bread. With the sweet and spiciness of your classic pumpkin pie, but the density, protein, and fat to keep you good and satisfied, this is one keto bread recipe you’ll keep coming back to. One of life’s most fulfilling moments is when you pick your first zucchini from your garden and turn it into a sweet and glorious batch of zucchini bread. Or, if you don’t have a garden, just pretend you do — and then make the bread. 😀 Either way, zucchini bread. This low carb zucchini bread is sweet and sticky like a classic zucchini bread, but its almond flour base makes it keto-friendly. And it gets an added boost of deliciousness with the addition of chopped walnuts. Want your zucchini bread to have a savory twist? Then this one’s for you! Sun-dried tomatoes give tang, Asiago gives a cheesy kick, and then of course your zucchini keeps this bread moist and veggie-packed. Pair this bread with your next meal, but you may want to double-batch it, because it will disappear fast. A traditional Indian bread, naan is a flatbread that is typically grilled in a cast iron skillet and topped with butter, garlic, and cilantro. And did we mention it’s the perfect way to sop up a little extra tikka masala sauce? This keto naan uses coconut flour to keep it low-carb, and it can either be pan-fried or baked if you prefer it. And this bread isn’t just for Indian food — you can top it with fixings for a flatbread sandwich, or just use it as a delicious side dish for your next dinner. Rye bread is just one of those classics — but unfortunately, rye is a wheat so it’s not keto-friendly. However, this keto bread recipe gives you the flavor of rye without the wheat and carbs. Instead, it uses a mixture of flaxseed and coconut flour, plus caraway seeds to give that unique “rye bread” flavor. This bread recipe is a little more involved than some of the others we have listed here, so give yourself time when preparing it. But once you top it with freshly shaved corned beef, you’ll agree that it’s worth the prep time! Who knew there were so many options for keto bread? These delicious keto breads are easy enough that anyone can make them, and they can help you manage those pesky carb cravings throughout the day. Plus, they’re all packed with proteins and fats that help you meet your macro requirements. And they’re so delicious you may never want to settle for wheat bread again! What’s your favorite way to manage carb cravings? Have you tried any keto bread recipes that you absolutely love? Fill us in by leaving a comment below, or share your favorite recipe! The keto naan looks yummy. I can’t imagine life without bread. I’m glad I can still have my fill of it even on keto diet. Keto naan is SO delicious. Keto bread recipes definitely help when adjusting to the keto diet.